Compared to other runners of his era, Frank had a noticeably muscular build thanks to his vocation. He stood 5’10 and weighed around 150 pounds. Frank ran for the Irish-American Athletic Club, even though he was of Bohemian ancestry. He won his first major race in 1915, the Brockton Fair Marathon, in Massachusetts. Frank enlisted in the U.S. Army at the start of the Great War. In 1916, he was stationed on the Mexican border as part of the force opposing Pancho Villa. In 1917, he shipped across the Atlantic to France with the 27th Pioneer Division. Frank served as a soldier and also as a cook. He won the AEF cross-country championship and also a marathon from Versailles to Paris. Upon his return to the U.S. in 1920, Frank entered and won the Trenton to Ft. Dix Marathon and the Brooklyn–Sea Gate Marathon. He was a member of the Whitney Post of the American Legion. 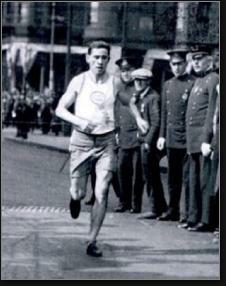 Frank entered the 1920 Boston Marathon and finished seventh. Near the end of the race he discarded his shoes and ran in his athletic stockings. Later that year, Frank qualified for the Olympic marathon team, but coach Mike Ryan chose not to enter him, questioning his fitness. Ryan was the record-holder in the Boston Marathon, having won the 1912 race in 2:22.12. Ryan’s decision looked highly questionable a year later, when Frank—now running for the Paulist Athletic Club in New York City—won the Boston Marathon…breaking his coach’s record in the process. He ran shoulder-to-shoulder much of the race with his friend Chuck Mellor, and then pulled away in the Newton hills. Frank broke the tape at 2:18.57. Seventeen days earlier, at the Auto City Marathon in Detroit, Mellor had finished seven seconds ahead of Frank. Frank switched to the Millrose Athletic Club in 1923 and nearly won in Boston again, but Clarence DeMar held off his late challenge. Frank won the Pontiac-to-Detroit Marathon that year. He won it again in 1924, at the age of 31. That race doubled as the Oylpic trials, so this time Frank made the team. Unfortunately, in his return to Paris, he could do no better than 18th. Frank retired from racing in the late 1920s and concentrated on his plumbing business in Newark. He retired to Las Vegas and passed away in early 1983.